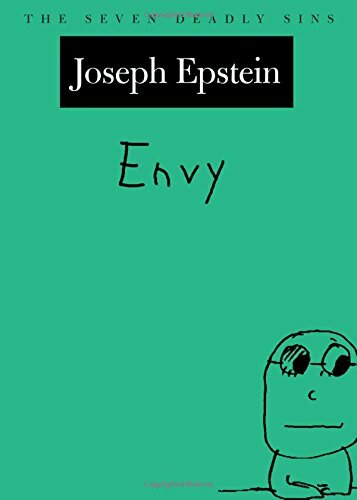 Joseph Epstein's Envy is a short, often humorous, sometimes insightful exploration of, as Epstein puts it, the only vice among the seven deadly sins that is, "not fun at all". Epstein holds a mirror to humanity, society, history, the literary and academic professions, and, above all, to himself in which the appearance of envy is shown as something both despised and embraced, and as something as pervasive as it is condemnable. With honesty and wit, Epstein chronicles the appearances of envy in everything human from the basic structure of society to his own his life's work, his mind, and his religious identity. In doing so he reveals envy's place as a fundamental motivation for both the best and worst in all of us. Epstein's book, according to the editor's note, "is part of a lecture and book series on the Seven Deadly Sins…[the purpose of which] was to invite scholars and writers to chart the ways we have approached and understood evil, one deadly sin at a time". Such a project represents a laudable and well needed return to an approach to moral thinking that embraces the particular and the ordinary dimensions of everyday life, that takes seriously the limits that human nature and human circumstance present for moral philosophy, and that recognizes the need for a more robust moral psychology upon which moral philosophy can be predicated. Epstein's down-to-earth realism and his conversational style of analysis offers a refreshing take on moral experience in an atmosphere where pedantry is often mistaken for precision and where professionalization and departmentalization has led to a regrettable sophistication about questions of virtue and the good life from within philosophy and an increasing skepticism about the usefulness of philosophy from without. Nevertheless, as welcome as the purpose of this series should be to those genuinely interested in understanding the character of moral experience, more often than not, Epstein stops short of making any real contribution to the understanding of envy. While important and interesting connections and distinctions between envy and such notions as jealousy, luck, justice, motivation, and ressentiment are intimated (connections and distinctions to which no one interested in the resurgence of moral psychology and virtue ethics can be indifferent) Epstein seems satisfied to point out the existence of these connections and distinctions and does little to explore how our understanding of envy in particular or evil in general can be improved through them. Where substantive claims are made, reasons and arguments are often passed over for pithy quotations (often taken out of context), as if the fact that Schopenhauer or Scheler wrote something similar is sufficient to establish that Epstein's own claim is insightful, reasonable, or true. Envy should be praised for its intellectual honesty, clarity, and good sense. However, for those seriously interested in the charting of the ways evil and the vices have been approached and understood, this book will be something of a disappointment. It is, no doubt, an enjoyable read that may generate some grist for the moral psychologist's mill, but, in its attempt to be widely approachable, it prefers idiosyncratic appeals to authority over reasoned justification and entertainment value over serious scholarship. Daniel Patrone is a Visiting Instructor and Director of Critical Thinking at Winona State University. He is the author of Leaving Morality Where It Is, forthcoming from Lexington Books.